Your outdoor green spaces should be beautiful, but should also serve a practical purpose. It’s where your family gathers, where you entertain family and friends, and where you go to enjoy the New Jersey seasons. Whether you are located in Cherry Hill or in the surrounding areas, such as Moorestown, Medford, Haddonfield, or Sicklerville, let Create-A-Scape unleash your lawn’s potential with hardscaping and landscaping services performed by experts in the field. Imagine entertaining family and friends on your outdoor patio crafted with cultured stone walls, complete with an outdoor kitchen, granite countertops, a BBQ grill, mounted television, and intimate lighting. Create-A-Scape can make this dream a reality. From fire pits and fireplaces to a luxurious patio or an outdoor living area with a custom-built bar, we specialize in creating green spaces and living spaces that are stunning, practical, and visually appealing. Our pavers are installed by professionals that have been performing this work for years. 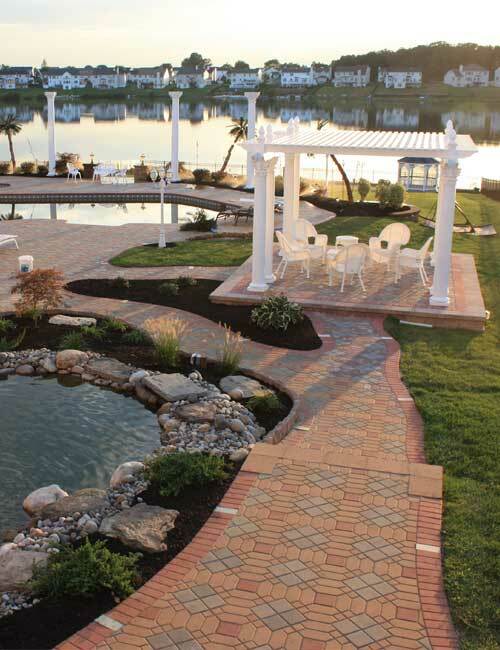 We are ICPI Certified for paver installation and we use TechoBlock, EP Henry, Anchor, UniBlock, as well as the installation of Natural Bluestone and concrete, or clay pavers. Spruce up your curb appeal with a hand-built mailbox featuring clay pavers. Your mailbox doesn’t have to be an eye sore when you allow the professionals from Create-A-Scape to design something spectacular to match your home. In addition, Create-A-Scape also customizes driveways, walkways, sidewalks, and patios for residential, commercial, and industrial clients in the New Jersey area. Make your green spaces and your paved spaces welcoming and inviting today. Our hardscaping services also encompass all necessary drainage work, outdoor lighting, and landscaping maintenance. Want a waterfall or fish pond to complement your patio or gazebo? Not a Problem – In Fact, It’s Our Specialty. Having outdoor green spaces you can enjoy during any season is important. In fact, we want you to be able to admire and utilize your lawn, outdoor living space, and patio whether the sun is shining or the snow is falling. Why not add some color to your outdoor oasis? We design, install, and maintain all plantings for businesses or residential clients with professional results. Consider signing up for our seasonal program that includes fertilization and planting of annuals, perennials, and winter plants for year-long beauty. 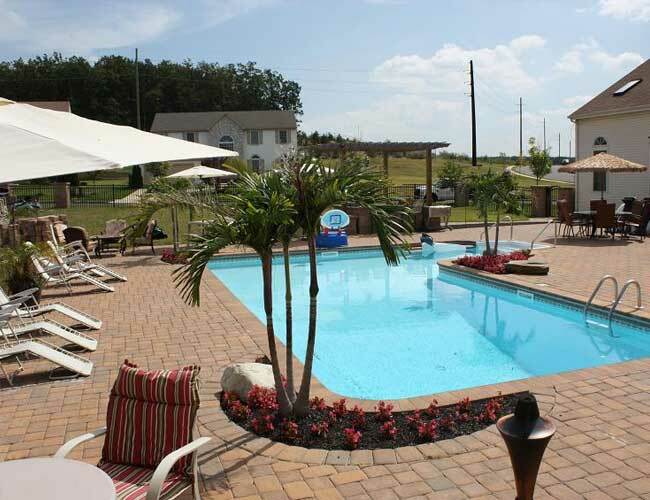 “Wow” your neighbors, clientele, and visitors with outdoor gathering spaces you can utilize for years to come. Create-A-Scape specializes in customized designs, hardscaping, landscaping, snow removal, and outdoor lawn maintenance for both residential and commercial customers. Our commitment goes beyond satisfying our customers – we are also focused on creating designs that have a “Wow” factor. Maximize your curb appeal with Create-A-Scape’s expert team. Contact us today to learn more about our comprehensive services and outstanding commitment to customer satisfaction.